that lets you select camera settings for an image and snap a photo to test those settings. your image pops up with your settings. and see how the changes you made affect your photo. from the auto program mode to manual. 1. If you select Aperture Priority: as you make changes to the size of the shutter opening (Aperture) the camera selects shutter speed for you to achieve proper exposure. The smaller the aperture number (f 2.8) the larger the opening. This lets more light in and gives a shallower depth of field. The larger the aperture number (f 22) the smaller opening. This lets less light in but gives a greater depth of field. 2. If you select Shutter Priority: as you make changes to the length of time the shutter opens (shutter speed) the camera selects aperture for you to achieve proper exposure. The faster the shutter speed 1/4000) the more the action is frozen but this also allows less light in. The slower the shutter speed (1 sec) you'll see motion blur in this photo. 3. If you select Manual: You control everything. Woo-hoo! Watch the Camera's Exposure Meter. the meter will look like this. The marker has moved left. You can add light by upping the ISO, slowing the Shutter Speed, or opening the Aperture. The marker has moved right. 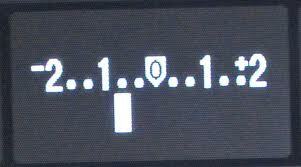 You will need to either lower the ISO, speed up the shutter speed, or reduce the aperture size. Each option will give you a different result. That's what makes this tool so awesome. and learn how to capture the creative images you desire. Don't forget to play with focal length and distance too!